"Hong Kong's ghosts : the politics of disappearance = 香港的魅影 : 消失的政治" by Ching Kiu, Stephen CHAN, Yan Wai, Connie LO et al. 11:00 a.m. -- 4:00 p.m. In 2016, when Connie Yan Wai Lo made The Vanished Archives on the 1967 anti-colonial riots, she discovered a strange absence of material in places like Kwun Tong's Public Records Office. This erasure will lead us in two different directions. On one side, we visit the Archives Action Group and the local struggle to keep the archives alive. 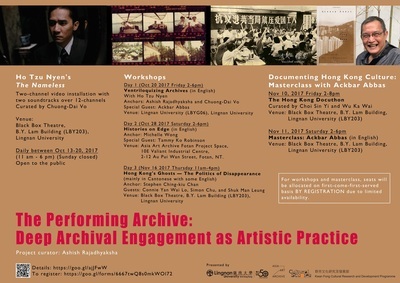 On the other, we will also go to the colonial archive, via Peter Moss, author of End of Empire: Hong Kong - Signed, Sealed and Delivered (2011), the bureaucrat apparently responsible for the extant film records of the 1967 riots. And we will ask these questions: Why do archives vanish? How do we fill in the blanks of history?